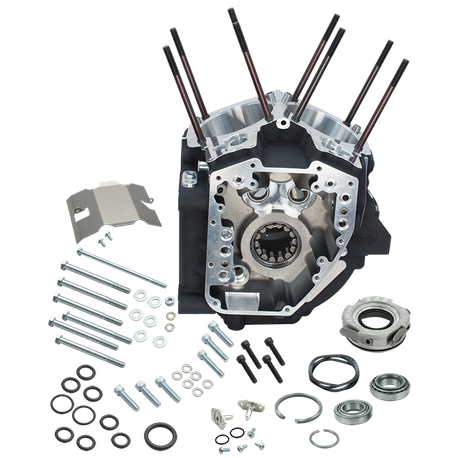 This stock bore crankcase is intended to replace the crankcases in HD® Twin Cam 88® engines in existing HD® chassis only. S&S stock style crankcases have a rear motor mount that bolts directly to the stock 1999-'06 transmission for all models except 2006 HD® Dyna®. These crankcases are compatible with the stock primary, charging system, and other stock components. S&S replacement crankcases are not available for HD® Twin Cam 88B™ or 2007-'16 HD® Twin Cam 96™ or HD® Twin Cam 96B™ engines. Greater overall strength than stock crankcases, especially in the front motor mount, an important consideration in high performance applications. All S&S crankcases use strong, dependable Timken® style sprocket shaft bearings to stand up to the most demanding applications. Clearanced for strokes up to and including 5". All passages between the crankcase cam support plate are o-ring sealed. Compatible with most stock components. Cam chest has clearance for up to .675" lift cams. Includes the S&S crankcase breather reed valve for HD® Twin Cam 88® engines designed to eliminate oil carry-over and oil scavenging problems. Oil line installation kit PN 31-0424 is required for installation in 1999-'05 HD® Dyna® models. This kit includes a special transmission top cover and oil lines. Oil line installation kit PN 31-0425 is required for installation in 2000-'06 FLT models. Stock transmission top cover may be used.